Lateral Entry to Senior Posts in Central Government : Need new windows be opened? HomeRiyaLateral Entry to Senior Posts in Central Government : Need new windows be opened? 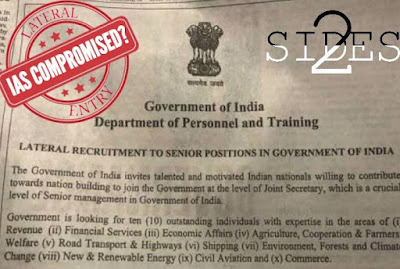 The Department of Personnel and Training’s recent advertisement inviting lateral entry of ‘talented and motivated Indian Nationals’ to the post of Joint Secretary , brings with it the prospect of senior level bureaucratic posts in several departments-established IAS territories, being opened to the public. The only three qualifications required include a minimum of fifteen years of work experience in the domain, a minimum age of forty years and a graduation from a recognized university or institution. The Government though at the moment is only offering applications to ten posts (Forest and Climate Change, Environment, Financial Services, Civil Aviation, Agriculture, Cooperation and Farmer welfare, Road Transport and Highways, Economic Affairs and Shipping) has through this move, opened a new doorway, creating a change in the age-old system of appointments to senior posts solely by means of closed loop promotions. This reform in the Government’s HR strategy is laudable. Senior posts such as that of Joint Secretary were previously occupied only by IAS officers and sometimes by members of central and allied services. The IAS is part of the permanent bureaucracy of India and an inseparable part of the Executive, ensuring political neutrality and administrative continuity to the ruling party. Though career promotions occur almost seamlessly with time, in the usual manner of events, it takes one over 16 years to get such coveted senior positions in the Government. An IAS officer is selected as a result of his ability to dabble in a variety of subjects, practically anything under the sun, despite his not being formally educated in any of these-this is so that he will be able to suit posts of different natures. The skills required by a Senior post such as the Joint Secretary of a department on the other hand, is more of a specialized nature and this is lacking in most IAS officers. IAS officers are rarely allowed to stick on to a single post throughout their career. On the contrary, they get shifted from department to department, from city to village and so on. The decision making skills IAS officers possess at a later juncture of their career is accrued as a result of experience and their knowledge of policies. Allotting such senior posts which require subject expertise to generalists (with very few exceptions) like IAS officers brings with it a mediocrity which is unavoidable. In this light, the recent call made to the public, seeking applications from specialists brings the prospect of the influx of fresher ideas and a much needed change. Also, people who have a dream for their country, but were never able to get through the multi-tiered selection process of the Civil Service Examinations owing to several factors, gain a chance to fulfil it.There would be an attempt by people to better their expertise in a few chosen domains,best suited for them and a spirit of competition will arise. A common man, who has been outside the loop for a long time, yet in the field, has a greater chance of bringing the right kind of momentum and change rather than an IAS officer who has been serving the government for a longer time-bright but lacking innovation and drive. Officers are aware of this and hence have always opposed the idea of lateral entries to government posts in India although it is quite common in other democracies such as the USA, Canada and the UK. If the system is indeed introduced in India in the right way, it will indeed be a timely shift in attitude by the Modi government in the light of a post-liberalisation era. A system of lateral entries into Senior Government posts would be akin to mixing bureaucracy with politics. People would be eventually selected not on the basis of merit, but based on their political and ideological inclinations. Unless there is a very transparent process for selection of lateral entrants, there is a great chance of favouritism, nepotism and underground money deals coming into play. It would be a good idea if the UPSC, the very same commission in charge of appointing IAS officers, can gauge the merit of specialist candidates and become the body in charge of selection of lateral entrants too. This would be better fitting than the setting up of an ad-hoc committee, the members of which may have political leanings and caste biases, leading to a not-merit based flawed system of selecting candidates. The entry of common people-specialists into an IAS occupied territory would definitely give rise to friction between the laterals and the civil servants. IAS officers are selected by means of a vigorous and extensive three stage process. The recent figures of 11, 35,943 applicants as opposed to the 15,452 candidates who qualified the first stage (Figures by UPSC for the year 2016) are an indication of the degree of competition involved. The lucrativeness of the Civil Services would wane with the introduction of a lateral entry system, since the entrants would be having it easy as far as IAS officers are concerned. Promotion prospects for those already in the civil services would be dampened. Lateral entrants will not be accustomed to the nuances of the system and stand a high chance of getting exploited. There is a good chance than they might become puppets in the hands of crafty and manipulating politicians. Also, IAS officers owing to their several years of experience in a multitude of climates and domains might have more real-world exposure than specialists. Lateral entrants could even be unfairly taken into posts as a result of the government trying to do away with an honest IAS officer opposing an unreasonable stance by the government. As of the present, we have a balanced system of civil servants in the bureaucracy and the move to introduce a system of lateral entry will only topple the established balance. The government would be inviting controversies and accusations of favouritism and casteism through this new move and things can get messy especially in the backdrop of the upcoming elections. Riya Santhosh loves coffee, paradoxes and friendly pet roosters.